Kid brothers are the cutest siblings. In you are elder sister, you would love to pamper your kid brother with Rakhi gifts for kid brothers. Rakhi is approaching fast falling on 15th August 2019. 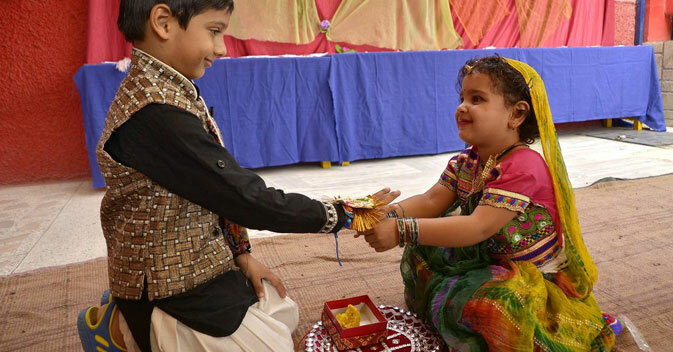 The unspoken feelings can be voiced out through Rakhi celebrations. A solicitous Hindu festival known as Raksha Bandhan is an occasion when siblings pledges to send best wishes of the world to each other. Whether it is kid brother, teenager brother or elder brother, the emotion and sentiments of a sister remains the same. Kid brothers are just like children to elder sisters. They look after like their own son. Indeed, kid brothers are showered with bag full of gifts on the event of Rakhi. So, what is stopping you this year? Shop from the creative collection of Rakhi for Children or Rakhi for kid brother and delight your kid friend. Select a Rakhi adorned with his favorite cartoon characters. You can even choose a Super Man Rakhi, Spider Man Rakhi or cute little Hanuman Rakhi. A plush teddy bear on a Rakhi looks very cute and sweet. You can buy this Rakhi for him. You would love to flaunt it the whole day. Naughty bunny Rakhi would amaze your kid brother. He would go around everywhere and show his Rakhi to all his friends. The kid brother will love sports car Rakhi. It looks gorgeous. In fact, any child will love to get this Rakhi tried on his wrist. Dragon Rakhi combined with chocolates will make your kid brother's Rakhi very unique and special. Besides, there are other Rakhis also in several other imaginative designs and shapes. You can even make a simple Rakhi at home if you find Rakhis expensive in the market. sendrakhi.com offers you interesting information on Rakhi for kid brothers. For further information, keep browsing the pages of the website.